It is well-known that your air ducts carry the warm and cool air that your HVAC unit creates in different rooms from your house. As a result, they should be kept in good working conditions in order to successfully meet your needs and requirements. What is more, an effectively sealed air duct system always works properly and, therefore, it will offer you many benefits. At some point, you will have to ask your air duct contractor for air duct replacement. Technicians at Air Duct Cleaning Porter Ranch claim that ducts that are over 10 to 15 years old require an urgent replacement. In addition to this, they may have very poor insulation or, worse than this, asbestos as the insulation material. Furthermore, when it comes to their installation, if these ducts were not properly sealed, it could lead to the air dispersion in the attic, basement or walls. In that event, you are facing a significant increase in your energy bills. You may ask yourself: why should I insulate my air ducts? The main reason why you should undertake this home improvement project is that your air ducts ensure your home’s heating and cooling system work as effectively as possible. In addition, insulated HVAC units are energy-efficient and prevent air loss. However, you may not pay enough attention to your air system. Most homes have to deal with leaky ducts and insufficient air flow. These problems lead to an uncomfortable living environment. You must take into account the fact that a properly insulated HVAC system provides your home with clean air all day long. 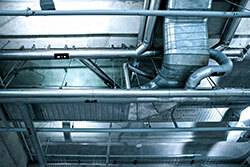 From another point of view, air ducts sealing promotes safety. In addition to this, gases will be expelled outdoors rather than drawn back into your rooms. As a result, you will manage to keep yourself safe and sound.